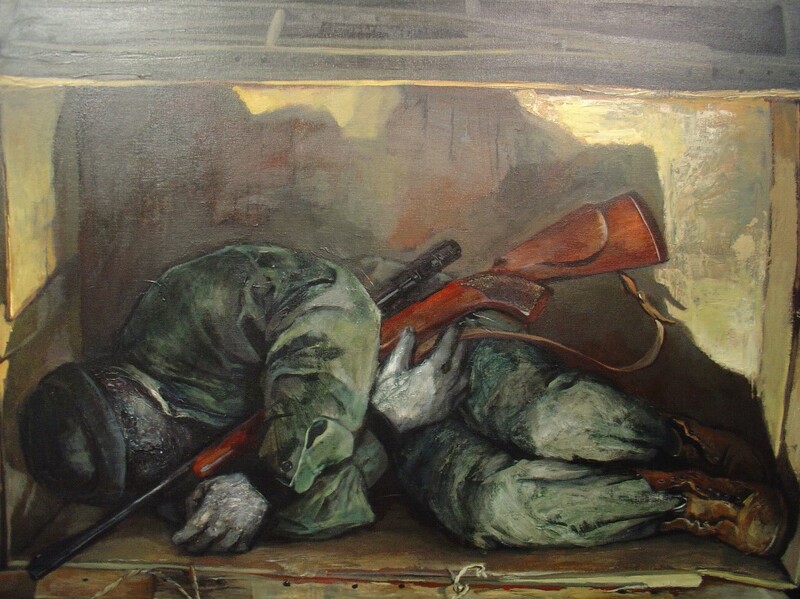 In the painting entitled Peacekeeper a silent figure of a soldier frozen by fear occupies a confined space, into which a harsh light casts a shadow larger than life. The soldier’s face is no longer visible. It is distorted by violence. Is it still alive or dead? This painting is a protest against the madness of war, an act by humans of ultimate and senseless destruction of the miracle of life and of all God’s creation. In contrast I ponder the magnificent beauty of nature in spring unfolding in wonderful complexity and the myriads of new discoveries and inventions by human beings. Everything points to the mystery of all being and above all to the mystery of the great I AM. Then my soul is troubled asking why after all the centuries of wars we are still plagued by this evil of violence and war. Who then is a peacekeeper? And who is a peacemaker today? Who will speak out for peace? And what is the peace that Jesus spoke of when he said: ‘Peace I give to you’? Yes, there will be peace. 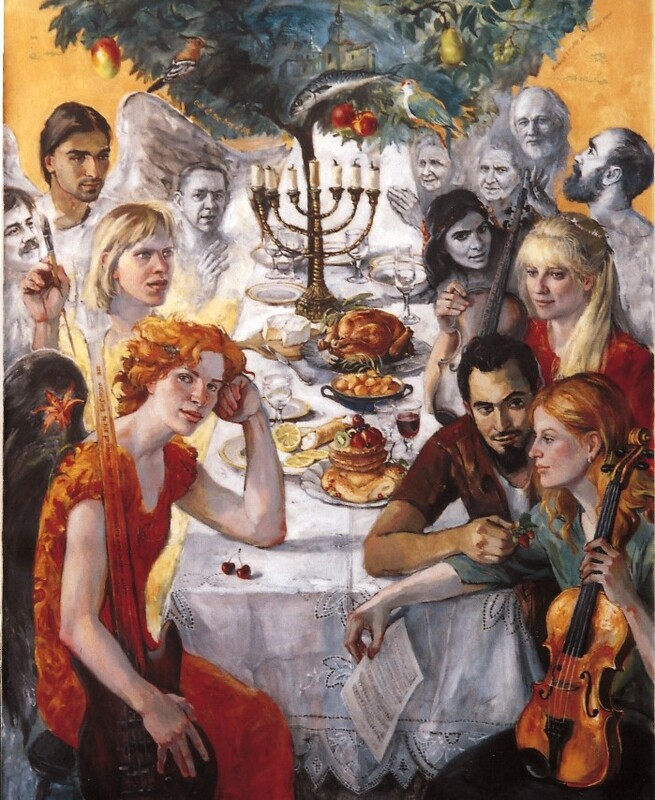 This painting, entitled The New Song, is a fusion of a real-life celebration of friends and family gathered over a meal and a vision of an anticipated heavenly banquet prepared for those who are invited to the wedding supper of the Lamb. Other spiritual realities include the Tree of Life for the Healing of Nations, musical instruments represent the new song of praise to God and the food delights symbolize all the marvelous things that God has prepared for the redeemed. Each face is intentionally unique, each person an individual who gains their full potential in communion with other believers through the power of God’s mercy and Christ’s redeeming love and salvation. Maria Gabankova: Peacekeeper, 1999, acrylics on canvas, 140 x 110 cm. Maria Gabankova: The New Song, 2002, acrylics on canvas, 152 x 127 cm.